Frome Youth Choir gears up for Christmas concert! Members of Frome Youth Choir are busy rehearsing for their annual free Christmas concert at Christ Church on Christ Church Street West in Frome. With just three weeks to go until the concert on Saturday 1st December at 3pm, the choir members are learning lots of new songs, all with a seasonal and starry theme, from ‘All The Stars Shone Down’ by Mary Lyn Lightfoot to ‘Sky Full of Stars’ by Coldplay. 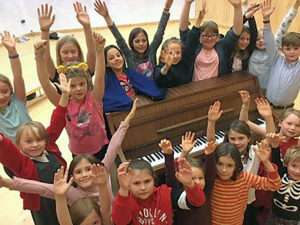 The choir, which is for young people from Frome and surrounding areas aged 6-14 years, is run by musical director Steph Collishaw, who has been a music teacher for over 23 years. Steph said, “We have some wonderful music to share with the public at our special Christmas concert on Saturday 1st December – it’s one of the highlights of the year for me and the children. “Lots of new children joined us this term, so please come along to our free concert on Saturday 1st December to show them your support. It’s always a lovely way to get into the Christmas spirit, particularly as there will be mulled wine, spiced apple juice and mince pies available to buy after the concert.